Although now retired, I have spent virtually all of my working life in the radio and television industry and feel the time has come to record something of the history of the early days of experimental television in New Zealand. In 1954 I joined the Bell Radio-Television Corporation as a technician and was involved in the manufacture, testing and alignment of radio receivers. Incidentally I might mention that it was the inclusion of the word Television in the company title which attracted me as a forward-looking youngster to apply for a position in the first place. At that time the main production was a plastic cased mantel radio, the Bell “Colt”; and a radiogram known as the “Truetone”. When Mr Al Bell formed the company of which he became managing director, he had the foresight to include the word Television in the title, an indication that he had his sights set on future developments; developments in which he intended to play a leading part. About 1956, with television as yet a shadowy image on the horizon, radio sales started to decline with no immediate prospect of a television service being contemplated by the Government of the day. At this time an engineer from Britain named Charles Rouse joined the company and, as he had experience with television in the UK, Al Bell decided that we would build a closed circuit television system. This consisted of a sync generator, a mixing panel, a live camera and a film camera plus a 16mm projector for showing films. There was no commercial equipment available in the country at the time and these items all had to be built from scratch with the exception of the sync generator which was a Taylor pattern and a Kelvin 16mm projector modified to take a 4-inch focal length lens. The British 405 line system was chosen as at that time the Broadcasting Authority was seriously considering using this system as the standard if a nation-wide television service was to be set up. With the successful building of the camera chains, using Vidicon tubes and associated equipment, it was decided that there should be a public demonstration of the new medium. The venue chosen was the 1957 Auckland Birthday Carnival at Western Springs held during February of that year. There a large marquee was set up, together with a stage on which various artists performed in front of the camera and films were shown between live performances. Continuity between the various acts and films was provided by an announcer. In order to provide viewing places throughout the Show a quantity of 405 line receivers had been imported from Britain (with a special license from the Customs Department) and these were placed at strategic sites around the showgrounds for the public to view. The vision and sound signals were fed to these receivers via a 75 ohm cable for video and 600 ohm lines for sound, the receivers having been modified for use as monitors. The demonstration was a great success and in light of this, later in the same year, it was decided that a demonstration should be carried out in the South Island and, for this venture, Dunedin was the site chosen. Arrangements were made with Brian Keene's apartment store in Dunedin which allowed us to demonstrate television in that city for the first time. The equipment was transported there in the back of a station wagon, accompanied by the factory manager, Ted Collins, the Chief Engineer, Charles Rouse and myself. On one occasion, the local radio station, 4ZB, conducted their Women's Hour session on the radio while we televised the programme throughout the store. At this location we provided two hours a day of viewing for a period of two weeks with monitors placed throughout the store and in the shop front windows where crowds would gather during the evenings. On our return to Auckland, after the successful demonstration in Dunedin, Al Bell decided to apply for an experimental licence which would enable us to go on the air and so reach a far greater audience. This application was made through the appropriate Govemment Department and in due course a licence with the callsign ZL1XQ was issued. Now, secure in the possession of a licence we could proceed with the building of the transmitters which would allow us to radiate a signal across Auckland. The transmitters were installed in our No. 2 factory at 75 Dominion Road by the same team which had built the camera chains, with help from technicians and engineers from outside the Company who had had experience with radio-telephone transmitters and, being very enthusiastic about the new medium, gave willingly of their time to help to get the station on the air. The site at Dominion Road was chosen as it was one of the highest points available in Auckland. Two aerials were used, one for vision and one for sound as no diplexer was employed to combine the signals into the vision aerial. After a period of experiments which involved raising and lowering the aerials for adjustments to improve the radiation pattern the system was declared to be satisfactory and ready to go. 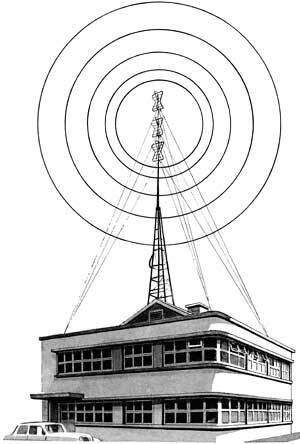 Using the authorised frequencies, 96.4 Mhz for vision and 99.9 Mhz for sound, the first experimental transmissions took place in May 1957 and by July regular ‘programmes’ lasting for around two hours were being broadcast on four nights of the week. Ostensibly, these were always referred to as 'experimental' transmissions in order to comply with the terms of the licence which prohibited the broadcasting of entertainment. As stated previously there were no commercially produced receivers available so all the enthusiastic technicians, servicemen and engineers began building their own sets from virtually anything they could lay their hands on, including ex-radar tubes with green or orange phosphors of diameters up to 7 inches (editor:10"). By this time the Seddon Memorial Technical College (now the Auckland Institute of Technology) which had previously obtained an experimental licence was also on the air. This meant that anyone owning a home made receiver now had two transmissions available on which to check their sets. As both Bell and "Tech" had to share the same channel care had to be taken to avoid overlapping their respective hours of transmission. By mutual agreement, Tech went first and were off the air by the time Bell came on at 7.00 pm. Bell's programmes lasted from two to three hours on four nights a week, Monday, Tuesday, Thursday, and Sunday. On the last two named nights enthusiastic local artists gave live performances in front of the cameras. We would call for reports on the reception of the transmissions and as increasing numbers of technicians completed their homemade receivers more and more calls came in reporting on signal strengths in various locations. The vision transmitter had an output of 100 watts and the sound transmitter an output of 25 watts. The programme sources we used were many and varied, ranging from travel films provided by the airlines and oil companies to test patterns from our pattern generator and live performances from many people who offered their services just to gain experience in front of the cameras. When using films we had to take care not to allow any advertisements to appear and this was done by the simple expedient of holding a piece of cardboard between the projector lens and the film camera for as long as necessary. We soon had so many requests from people wanting to perform that a lady by the name of Olive Scott offered to co-ordinate the acts which then allowed the technical staff to concentrate on their own jobs without having to worry about trying to deal with enthusiastic artists seeking camera experience. Olive Scott was instrumental in forming a group called Pacific Television Productions who assembled all the artists and nominated dates and times for them to perform during live transmissions. This group was not part of Bell Radio-Tv, but worked in close liaison with the Company and provided a great source of programme material for the experimental station. We had singers, dancers, magicians, animal acts, brass bands, orchestras, solo musicians, judo demonstrations and other acts too numerous to recall. The services of announcers from local radio stations were also willingly given as they were all interested in gaining working experience in the new medium. A newsreel film was made each week by photographer Hany Reynolds about items of interest happening in and around Auckland and this was shown during Sunday night transmissions. By this time we had obtained a 625 line receiver from Australia and had installed a large log periodic antenna (21 elements as I recall) on top of the building facing due West towards Australia. This receiver was always turned on during the evening just in case any signals were received from across the Tasman. This procedure was continued for some time until one Tuesday evening in November 1957 when the sunspot activity was very high. We were just about to conclude transmissions for the night at about 9 pm when intermittent sound and vision signals were received on the 625 line set. Reception remained poor for about half an hour then settled down with no fading at all and channels 2,7, and 9 from Sydney were received without any interruptions for the next three hours, the pictures being absolutely noise free and rock steady. With this source of material available to us we decided to rebroadcast the Australian transmissions by setting up the 405 line video camera and a microphone in front of the 625 line receiver and transmitting the signal for the benefit of local experimenters. Strange as it may sound now it was a very exciting time, both for ourselves and for those who were watching out in the field. Radio Inspectors from the NZ Post Office (the Government department monitoring all radio transmissions at the time) were very interested in our work as, here again, they were learning about the medium and would report in on the strength and quality of our signals. As I recall, the Chief Radio Inspector was Ted Wilcox. Field coverage of the Bell transmitter extended from Helensville, approximately 50 km North of Auckland to Pukekohe, approximately 50 km to the South of the City. The NZ Government had not made any decision about television broadcasting and there was no commitment from either Government or Opposition to the introduction of a service. Our transmissions were generating a great deal of interest among Aucklanders and work was also progressing within Government Departments where finally a decision was made to adopt the CCIR 625 line system if a service was introduced. It was therefore quite a shock when the Company received a letter stating that not only had we to change from 405 lines with AM sound but we also had to shift frequencies to 88.75 Mhz (sound) and 83.25 Mhz (vision) and employ the CCIR 625 line system. At the time this change was ordered discussion did take place with the powers that be as to the suitability of the new frequencies allocated as part of the channel we were to use was within the band which could be used for future FM radio transmissions. The Company, being suspicious, queried this point but was assured that there would be no problems as any FM service would be many years away. As time went on into 1958 all was proceeding well and, although in the terms of our experimental licence we were not broadcasting entertainment, interest was growing in the community. Rerunning the same old films 30 or 40 times interspaced with test patterns was for the benefit of technical people who were working on their own receivers at home. However, some of our live transmissions had created interest among the general public who could see the benefits of entertainment in the home as they came to realise what great potential the new medium had. During the course of our experiments we did an outside broadcast which showed the opening of the new linear accelerator for the treatment of cancer at the Auckland Public Hospital. To achieve this we packed two camera chains and their associated gear into a truck together with vision and sound transmitters with two portable dipole aerials and transported everything to the Auckland Hospital where it was reassembled on site to televise the opening of the new facility. The transmissions showed the arrival of the guests and official party, the opening speeches and the inside of the building where the linear accelerator was housed. To the best of my knowledge this may have been the first outside broadcast in New Zealand. On another occasion we were approached by staff from Greenlane Hospital and asked if we would televise an operation involving repairing a hole in the heart in a live sheep. A camera was set up in the operating theatre and monitors placed in the hall so that 150 doctors could watch the procedure as it was impossible to accommodate that number of people around the operating theatre. By mid 1958 virtually all the problems we had run into when changing over our equipment had been overcome and our experimental transmissions were progressing very well. In addition we were attracting announcers from the NZBS such as Ian Watkins and Merv Smith who appeared in front of the camera so that they could gain experience working in the new medium. The Government was still not very enthusiastic at this time even though the Minister of Internal Affairs Mr Anderton, appeared before the camera in October 1958 to talk about his trip to Antarctica. This was somewhat surprising as by this time the Government had gone to the country in 1957 with the introduction of television as an election plank. It was about this time that we were yet again ordered by the Post Office to shift frequencies. this time to channel 6 using 189.25 Mhz for vision and 194.75 Mhz for sound. The reason given for requiring this change was that we were operating within the 88-108 Mhz band which was reserved for FM radio use. Once more we had to go through the process of modifying the transmitters and aerials before we could continue with our transmissions. The word throughout the industry at this time was that the government of the day was making it as difficult as possible for Bell to continue transmitting and although instructions for all changes came from the Post Office the policy was being orchestrated by the Govemment in an attempt to force us off the air without actually withdrawing our licence. By now the whole situation had become very political with questions being asked in Parliament. Finally the Government of the day under public pressure decided to set up a service which came into operation in June 1960. The last time Bell’s station, ZL1XQ, was on the air was early in 1961 when a fire at the NZBS studios at Shortland St temporarily forced a closedown. Bell filled in the gap by transmitting test patterns and old travel films while NZBS repaired their smoke damaged equipment. Having accomplished his avowed aim of forcing the introduction of television in New Zealand, Al Bell was now ready for his next step, to be the first in the field of television receiver manufacturing, but that is another story.